Win over every potluck guest with these phenomenal BAKER'S Caramel-Bacon Brownies! 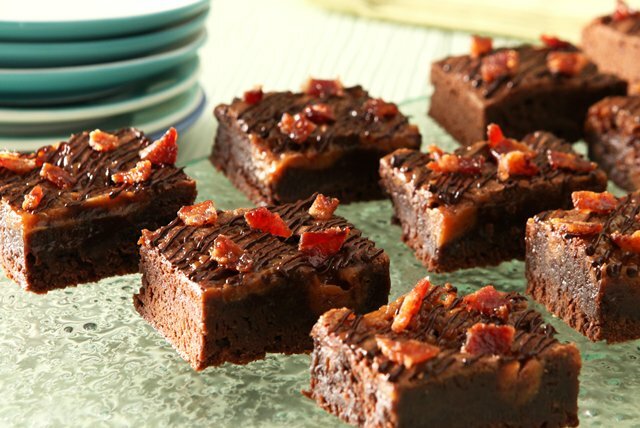 These BAKER'S Caramel-Bacon Brownies are drizzled with melted chocolate and topped with bacon crumbles for the ultimate sweet and savory flavor combo. Line 13x9-inch pan with foil, with ends of foil extending over sides. Spray with cooking spray. Microwave unsweetened chocolate and butter in large microwaveable bowl on HIGH 2 min. or until butter is melted; stir until chocolate is completely melted and mixture is well blended. Add sugar and eggs; mix well. Stir in flour; pour into prepared pan. Microwave caramels and cream in microwaveable bowl on HIGH 2 min. or until caramels begin to melt; stir until caramels are completely melted and mixture is well blended. Stir in 1/2 cup bacon. Drop, in spoonfuls, over batter in pan; swirl gently. Bake 30 min. or until toothpick inserted in center comes out with fudgy crumbs. (Do not overbake.) Cool completely. Melt semi-sweet chocolate as directed on package; drizzle over brownie. Sprinkle with remaining bacon. Let stand until chocolate glaze is firm. Use foil handles to remove brownie from pan before cutting to serve. The smoky bacon adds a savory twist to this special-occasion sweet treat.